T-304 Stainless steel elbows, u-bends, and straght tubing can be used to create your custom system. Elbows and u-bends are mandrel bent for maximum flow. 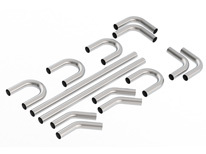 Kit contains (4) 450 elbows, (4) 900 elbows, (4) 1800 u-bends, and (2) 5' long straight tubing sections. Brushed finish can be polished prior to installation. Size is outside diameter. Universal Hot Rod Kit 2.5"